Here’s a hot take if there ever was one. Who could have guessed that a prequel to a spin-off (also a prequel) of the first movie of a four-year-old film series would be the most effective fright film of 2017? Now, I feel it is necessary to preface this by saying that I—probably as well as a whole lot of other people—was convinced this movie was going to be just straight up terrible. I went into the theater with a whole grip of jokes at the ready, but damn it all if I was not surprised. ANNABELLE: CREATION is simply the most well-executed and downright scary movie so far this year. And no, I didn’t forget about GET OUT. The plot is simple, if a little trite. A young girl dies tragically. 12 years later, six orphans, along with their chaperone, Sister Charlotte, are taken in by a dollmaker and his mysterious, bedridden wife. Just as soon as the girls make themselves at home in the old, isolated estate, creepy things start happening. And it is Janice, made lame and ostracized by polio, yet no less good-natured, who is most attuned to the house’s sinister energy… or to whom that energy is drawn. At first, the occurrences are so benign they may very well be nothing more than the product of a young, overactive imagination—creaking floorboards, doors unlocking, a bell jingling at odd hours of the night—but it isn’t long before all hell breaks loose. Now, don’t get me wrong, this movie is far from perfect. It has a host of problems—some of which were glaring enough to momentarily pull me out of the film. CREATION, like many modern horror movies, suffers from its fair share of eye-rolling “idiot plot” contrivances wherein some really dumb decisions are made. However, this is at least partly assuaged by the fact that most of the characters are young girls. And, on the other side of the coin, those girls are all surprisingly good actresses. Lulu Wilson (coincidentally, also last seen in OUIJA: ORIGIN OF EVIL) stands out especially as Linda, thick-and-thin best friend to Janice (Talitha Bateman). Not only is she completely believable, but she gets to say one of the best lines in recent horror memory. When a horrified Charlotte (Stephanie Sigman) asks Linda what terror she just saved her from, Linda shouts, “Who cares, run!” It’s pretty great. Okay, run, yeah, but what the hell are you doing?! And yet, for all of its problems, ANNABELLE: CREATION pulls from an even greater number of strengths working in its favor. I know that may come across as a shaky line of praise, but let’s be real here for a minute. If you go into a movie like this expecting an airtight plot, logical decision making, or anything remotely grounded in reality, you’re going for the wrong reasons. The reason people flock to movies like THE CONJURING, INSIDIOUS, and SINISTER (or any of their harebrained sequels) is in the hopes of a getting a few decent scares. That’s really about it. In that regard, ANNABELLE: CREATION not only succeeds, but it blows all of those other films out of the water. This is in part because, despite touting itself as a movie about a possessed, evil doll, ANNABELLE: CREATION is really much more of a haunted house film. Annabelle is not only the titular doll, but the young girl who was killed all those years ago—and whose spirit (or so it seems) still inhabits the girls’ new home. Dolls aren’t all that scary, no matter how freaky looking they are. And neither are ghosts or creepy little girls, at this point. Sandberg is smart enough to know that the greatest fear of all is that of the unknown. Where many of today’s horror films rely on cheap jump scares and sharp volume spikes to elicit a fear response from the viewer, ANNABELLE: CREATION focuses most of its energy in cultivating a deeply pervasive atmosphere of dread. It’s about what could happen. What can be imagined is always worse than reality. In much the same vein, CREATION also taps into another, oft-forgotten well of fear: childhood. 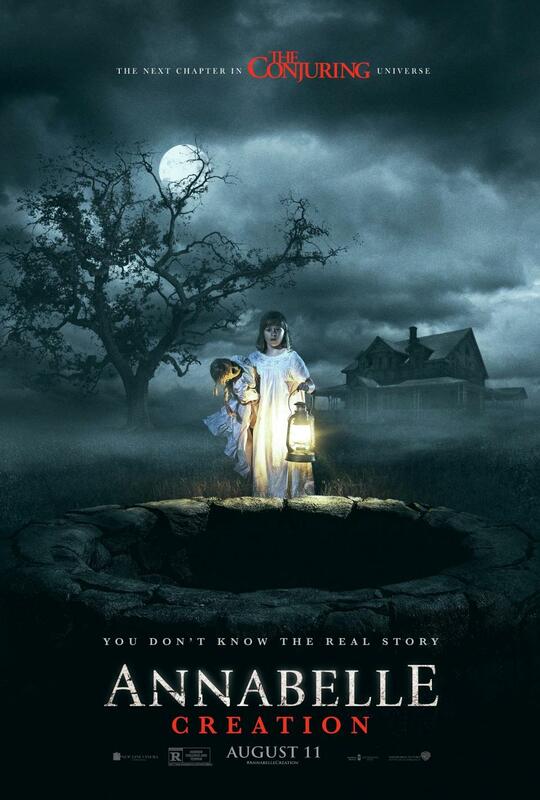 As the ghost stories told round the campfires of our youth (or under blanket-forts, for the urbanites) kept us up at night, and in the way that their inevitable nightmares rarely made any kind of sense, ANNABELLE: CREATION, operates on a twisted, childlike dream-logic that makes all of those ancient fears feel that much more real. Perhaps more importantly, Sandberg also understands that today’s moviegoers are hip to the game. It’s easy to give a jolt, especially when it comes from stabbing out someone’s ear drums. It’s considerably more difficult to sustain a reaction as involuntary and as fleeting as fear, especially when someone is anticipating it. Sandberg knows what the audience expects, and he plays directly into it—utilizing those expectations when appropriate, but then subverting them to take viewers by surprise and put them right back on edge. He is so successful in this because of how expertly he utilizes all the right kinds of psychological button-pushing. To that effect, the devil is in the details. There is a whole lot of misdirection at play in this film—events gradually build to nothing; the eye is lead to one end of the screen, missing what happens in the other—and the sense of unease it creates is maddening. Sandberg’s scares are so well-constructed and his craft so measured, that when he finally decides to stop toying around, it all hits so much harder. Every weird, ill-defined fear the viewer has been trying to push to the back of his or her mind is catapulted right onto the screen, and oh my god, do things go crazy. But for how deftly Sandberg baits-and-switches his viewers, ANNABELLE: CREATION has one more trick up its sleeve—this is not a modern horror movie at all. Director David F. Sandberg has clearly done his homework, elevating what could have been just another run-of-the-mill, haunting/possession flick into a gorgeous film that honors horror’s rich history, while creating its own powerful visual language to boot. The group of hapless young girls beset by a malevolent presence within a beautiful, yet imposing, old house calls to mind Dario Argento’s SUSPIRIA, as much as the film’s supernaturally-inspired descent into madness echoes Stanley Kubrick’s THE SHINING. But, more than anything else, Creation takes its cues from Robert Wise’s THE HAUNTING. Most of the comparisons that could be made are pretty obvious, such as the ways in which the scares are set up (or even just “girls are terrorized in a haunted house”), but they go much deeper than that. Sandberg shoots his film in much the same way as Wise’s 1963 film, utilizing many of the same camera tricks—long tracking shots, disorienting pans, and low-angles—that made that film so unnerving to viewers. It’s a fairly small thing, but it goes a long way in tying everything together—a bit like putting a cherry on top. Horror is, and always will be, my favorite genre. I have seen just about everything there is to see, and, for better or worse, I can count the number of films that have truly frightened me on one hand. While ANNABELLE: CREATION may not have shaken me to my core as those few films did, it is positively mortifying throughout much of its runtime, and it’s pretty fun, too. And that right there is about as high of praise as I can give. Joseph Simpson prefers to be called Jack; yes, he knows that's not the actual nickname for Joseph. He is the only person in his family who can grow a beard. You really think this is better than get out?